The Atlantic 10 is a league that has flourished off the success of incoming transfers. Look at recent examples like B.J. Johnson (La Salle), Charles Cooke (Dayton), and Tyler Cavanaugh (George Washington), who all took over as some of the best players for their respective teams. Yet again, college basketball is seeing players transfer all over the country, and while the A-10 has gotten its fair share of added talent, it’s lost some as well. Today, we’ll look at 3 impact transfers heading into the Atlantic 10 for the 2018-19 season. Keep your eye on these 3 names, as they’re sure to make an impact come November of this year. The big fella might be the missing piece to George Mason’s puzzle. Can the Patriots break through and finish near the top of the league — or better, make it all the way to the NCAA Tournament? The redshirt junior has great versatility in the post, something that the Patriots didn’t have much of last season. But with a year of experience under Goanar Mar and Greg Calixte’s belts, GMU looks like it will have one of the more formidable frontcourts in the conference. 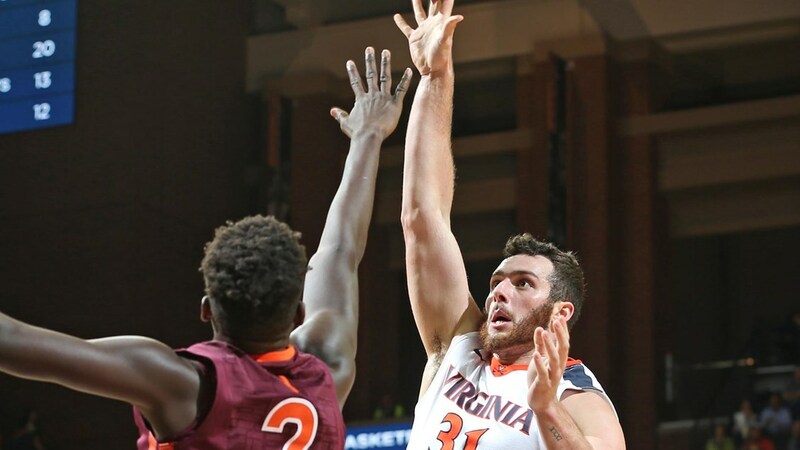 Reuter is a transfer from Virginia who averaged 3.8 points per game two seasons ago, but with plenty of playing time, he could rack up double-doubles on a nightly basis. At 260 pounds, Reuter provides much needed bulk in the paint, and he’ll be capable of bullying smaller forwards in the league. He’ll be a target down low that should help free up shooters Otis Livingston II and Jaire Grayer from behind the three point line. The Patriots shot a mere 32.6% from downtown last season as a team, but the presence of Reuter inside will likely force perimeter defenses to play a little closer to the basket. If guys like Justin Kier could find their stroke, this team could light it up in a hurry. After sitting out a season, redshirt junior Curtis Cobb is ready to make his impact for the Minutemen, and it sure could be a big one. As a sophomore with Fairfield, Cobb shot 34.1% from three, making 56 buckets. Though he had his off nights from long range, when he was hot, he sure as heck was hot. Cobb had 7 games his sophomore season where he hit at least 4 three pointers. Not to mention, Cobb had a 46 point night where he buried 9 of 12 three point attempts. That sounds like a Luwane Pipkins stat line. Speaking of Pipkins, he’s going to have a great supporting cast in the backcourt with Carl Pierre having an incredible freshman season and now the addition of Cobb. Another thing to like about the redshirt junior is that he’s an above average defensive rebounder, which is great for a guard. Given the fact that Massachusetts ranked 13th in the conference in defensive rebounding percentage last season, the Minutemen could use all the help they can get on the glass in 2018-19. All in all, Curtis Cobb should be a great addition, and if this isn’t the year Matt McCall gets his team back to the Big Dance, then Cobb and Pipkins’ senior season is going to be one heck of a ride. In his final collegiate season, Tramaine Isabell is headed back to Missouri — the state in which he started his freshman campaign. In 2014-15, Isabell played for Mizzou before transferring to Drexel for his junior year. Now, the Billikens have an experienced guard who averaged 21.0 points per game last year for the Dragons. Isabell affected all facets of the game last season and really erupted to meet his full potential. He was one of the best in his conference at drawing fouls and getting to the line, and at the same time, he seldom commit fouls on the defensive end of the floor. Isabell is also a strong distributor, hit 57.5% of his two pointers in conference play (which is incredible for a guard), and even broke the 40 point barrier with one heck of a performance last season against Elon. Isabell is quick and powerful, and he makes great decisions with the basketball. That could honestly be his greatest asset, as he’ll be joining a young Billikens team that’s expected to make a lot of noise in the conference this year. The senior should have an enormous impact on this SLU team in 2018-19, and should he live up to his full potential, he’ll have a chance to go dancing before leaving the collegiate scene.